When parents bring their children to the Cox Children's Center, they can rest assured their kids will be surrounded by caring employees such as Kristin Kruger, who is the University of Illinois Springfield Employee of the Month for July. Kristin is passionate about the field of early care and education, and she lives this passion at UIS. She volunteers at local early childhood workshops to share her experience and creativity; she trains and mentors student employees who work at the childcare center; and she maintains lasting relationships with families. "She has a strong work ethic and manages to exemplify quality in all that she does and regardless of the time and/or commitment that it takes," writes her nominator. In 2014, Kristin was awarded the Terri Lynne Lokoff/Tylenol National Child Care Teacher Award, which acknowledges the critical role of child care teachers in providing quality early care and education. 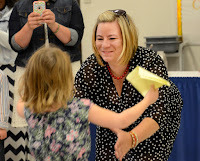 She serves on the Sangamon Success committee as an early childhood expert, and she's presented at local conferences for the Association for the Education of Young Children. On top of all this, she approaches every day with a positive attitude. "She responds to any challenge with an 'we can do it' approach and challenges others to be with her," her nominator writes.